Polybutene-1 (PB-1) piping systems have been in continuous service in Europe and Asia for over 40 years in pressurised hot and cold water installations. Discovered in 1954 by the research team of Nobel Prize winner, Professor Natta; PB-1 is now widely recognised as the state-of-the-art technology for piping systems across a broad range of applications. The pioneering work of Karl Ziegler and Giulio Natta continues to shape and improve our lives. These two fathers of modern polyolefins changed the world with their discoveries. They were recognised with the Nobel Prize in Chemistry in 1969. Polybutene-1 (PB-1), was discovered in 1954 by the research team of Professor Natta. It is a thermoplastic polyolefin similar to polyethylene and polypropylene produced through the polymerization of butene-1 using stereospecific catalysts to create a linear, highly isotactic and semi-crystalline polymer. The first industrial production and introduction into flexible pressure piping systems started in Europe in the mid 1960’s. Since its introduction, countless new and innovative PB-1 grades have been introduced for many popular applications. 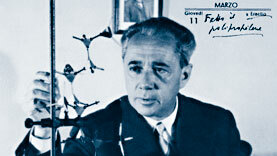 1954 – Polybutene-1 (PB-1) was first synthesised by Prof. G. Natta, Italy, one year after polypropylene. 2000 – Oct. Montell Polyolefins merged with Targor GmbH and Elenac GmbH to form Basell Polyolefins. 2000 – Dec. Basell approves a new 45 kt PB-1 plant in EU using a new PB process from Basell R&D in Ferrara, IT. Long-term ISO 9080 tests performed on PB-1 pipes project service lifetimes of 50 years or more for pipes operating with water at 70°C, at 10 bar pressure. PB-1 pipe applications installed in Europe for underfloor heating (since the early 1970s) and district heating (since the early 1980s) are still operating successfully. As an example, PB-1 pipes were installed in the Vienna Geothermal Project in 1974, replacing metal pipes which proved unsuitable due to rapid corrosion and operated without problems until 2010 when an expanded system was installed. The Vienna Geothermal project utilises very aggressive geothermal water as the heating medium. The PB-1 piping system ran continuously for 36 years at a constant temperature of 54°C and a pressure of 10 bar – with zero breakdowns. In addition, PB-1 pipes are expected to have service lifetimes of 25 years or more when exposed to water containing 2 ppm chlorine at 20° C. PB-1 pipe has been shown to perform for >1,000 hours in chlorine content of 30 ppm at 30 C/6 bar (Test Report-No. PB 1087C, Infraserv Höchst Technik, 2004). PB-1 piping systems are increasingly specified in well-known locations such as: Royal Albert Hall, Canary Wharf, Imperial War Museum North, Säntis 2000 and many more (see case studies on this website). Since the first successful installations, most of which are still in operation, continuous advances in PB-1 material technology, physical capabilities and production processes, combined with the implementation of stringent international standards protocols, has progressed the performance of PB-1 piping systems to new levels. In 2008 the PB-1 plant capacity was expanded from 45 kt to >60 kt. Plans have been made to increase global production further to ensure the supply of PB-1 keeps pace with the accelerating demand, particularly in its largest application, piping systems. The PBPSA members are world leaders in the innovation and production of fit-for-purpose piping systems for a diverse list of technical applications. All members have ongoing collaboration with engineers, architects and installers of piping systems and offer support for project specifications and research to assist customers and build the practical knowledge base for PB-1 piping systems. Over the period Polybutene-1 has been on the market, those systems have become increasingly sophisticated with continuous improvements in product capabilities including jointing techniques, installation and reliability – all providing longer operational lifetimes and increased security for piping installations.